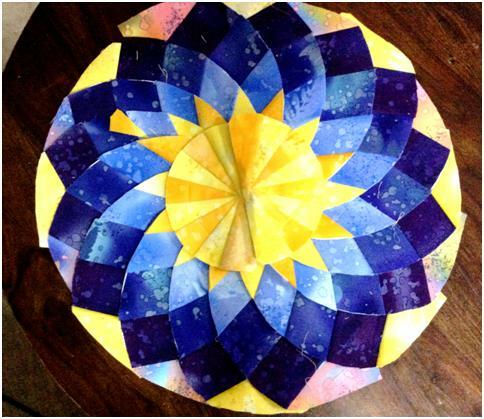 Introducing – the “ Dreamcatcher – Round the Year” Quilt! I am so happy and excited to introduce my “Block of the Month” (BOM) quilt “ROUND THE YEAR” from July 2014 – June 2015! 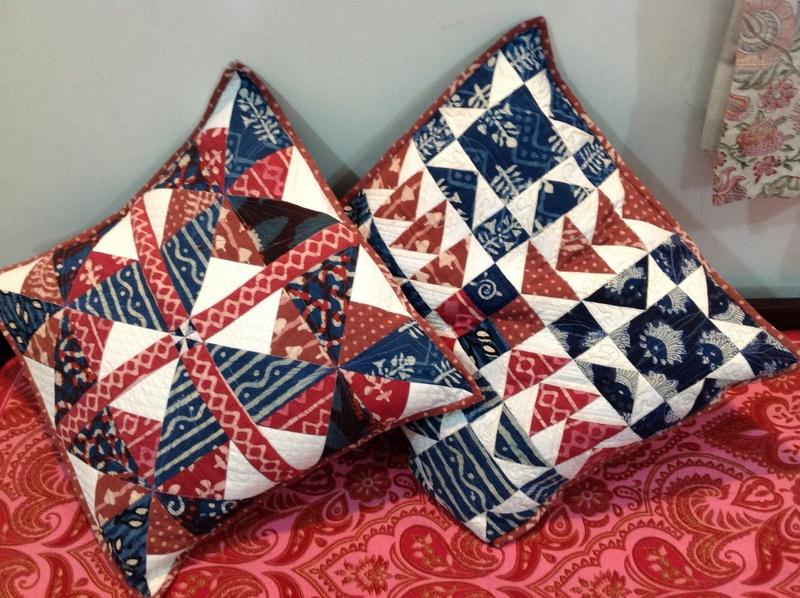 You do not have to be an experienced quilter to be able to make the blocks (which look so difficult!!) that make up this quilt. Initially, one just needs to know how to stitch on a straight line printed on paper. Lots of pictures shall guide you each step of the way, just like a quilt along! Designed by me on Quilt Assistant sotware, and inspired in part by the Camelot quilt by Trish Harper, the quilt will have sixteen blocks, each a 15” circle set in an 18” square. Unlike the Camelot (which is hand-pieced), these are, as far as possible, paper foundation pieced. The blocks have been drafted/ designed using traditional patterns based on circles/ curved piecing ( yet simple to assemble) like the Mariner’s Compass, New York Beauty, Dahlia, card-trick, drunkard’s path, winding ways etc. besides improvised Camelot-like blocks etc. However, an attempt is made to incorporate other techniques, where possible, in the blocks that come up later, so that the blocks do not become repetitive and boring over the year. To help you along, complete patterns in .pdf files and several pictures will be posted with each block, tested by me or generous fellow quilter volunteers! One to two blocks will be released each month, a total of 16 over 10 months. The last two months are set aside for putting together the top and quilting and finishing the project. 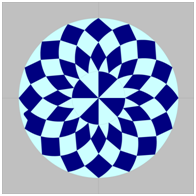 We shall be joining them up them up in the traditional 4X4 layout, but…if you find this too much to handle…you could piece just a few blocks surrounded by a lot of negative space to make up your quilt. You could even make a single circle block and use it as a table topper like the DAHLIA here (which even a beginner can whip up in a few hours!) This, incidentally, is also Block Number One of the quilt! 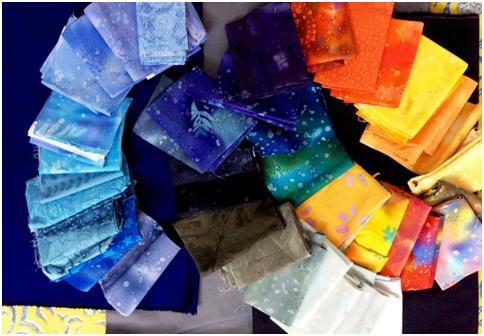 – I am making my quilt with shades of blue as the main colour and yellows to oranges as the focus fabric. I am setting them in squares in various shades of blue to grey. – For each of the blocks, I am suggesting 2 more colour ways! Firstly, there is a two-colour option. There is another option with a black & white print as the main fabric and the colour wheel as the focus. 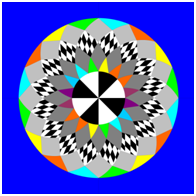 The circles are set on a blue background. You could, of course, use any other colour-way that you like or go totally scrappy! I shall post the fabric requirement on 7th July 2014 here on my blog. The detailed instructions for each block will be made available on this blog on the 1st /15th of each month from 15th July 2014. The block pattern in colour, with colour codes and fabric requirement. Colour coded templates for paper foundation piecing where required. A Master Template with block assembly instructions. I shall be using fat quarters of Fossil Fern by Benartex, with some batiks thrown in! Here is a look at my fabrics. My Fossil Fern by Benartex fat quarters for the quilt! And here is a look at the options for the first block, pattern for which is coming up on the 15th of July! In the meanwhile, you can decide which of these you would like to make. My friend, Aliya Mir has been kind enough to test this block for me, using her own colour combination. Watch this space to see her oh-so-pretty block ! Would you like a sneak peek at it? Here it comes! 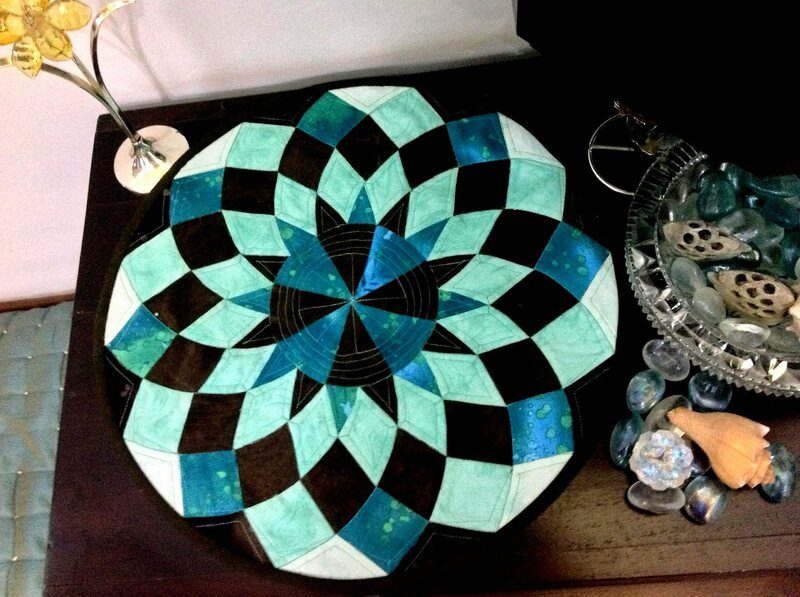 Meanwhile, this is how my `DAHLIA’ block is shaping up – I quite love it! Perhaps we can start a facebook group to share pictures of our blocks as they come up. Or share them on flicker? I look forward to your suggestions! Author MadsPosted on June 29, 2014 April 13, 2018 Categories Free Stuff - Tutorials and Patterns, Patchwork of my life, Round the Year quiltTags Block of the Month Quilt, Dreamcatcher Quilt, Free Quilt BOM 2014, free quilt pattern7 Comments on Introducing – the “ Dreamcatcher – Round the Year” Quilt! Windmills – No longer a UFO! I finally managed to complete a project that began as blocks for a charity quilt! The Block of the Month was scrapped, and two orphan blocks became UFOs ( unfinished objects, for those uninitiated into quiltese ) rescued to be made into cushion covers. 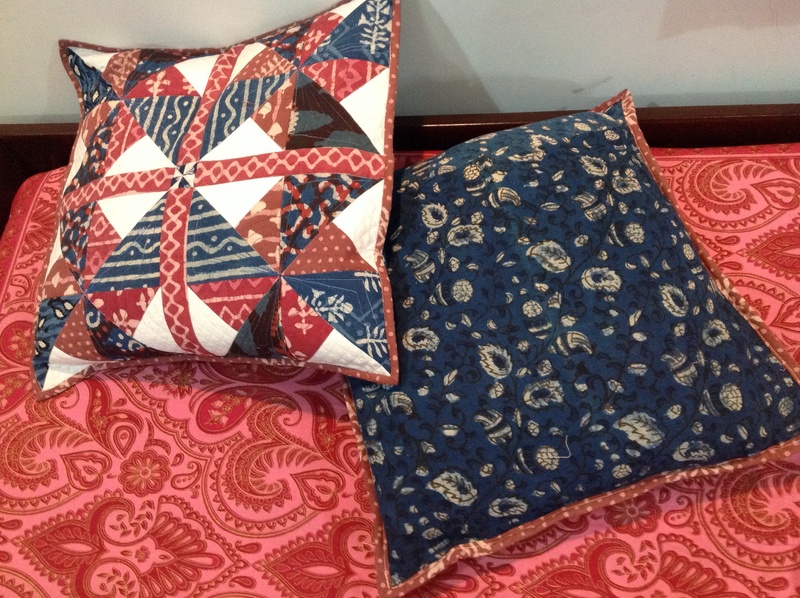 I have used Jaipur ‘Dabu’ fabric ( which uses a traditional mud-resist hand block printing process). 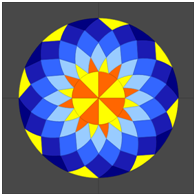 A tutorial for the pinwheel block is available here. 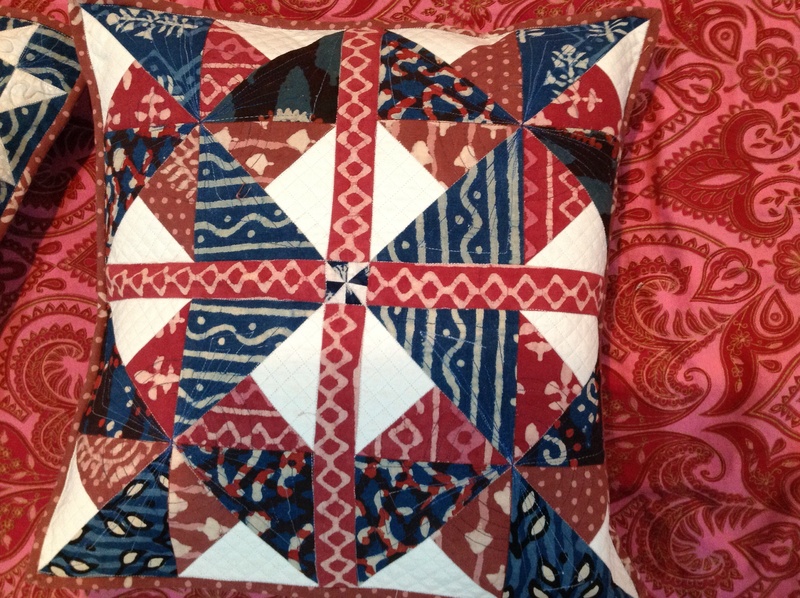 It is adapted from a quilt pattern published the Better Homes and Gardens quilting series. The other flying geese block is adapted from a 6″ block from a 1860s quilt by Salinda Rupp, popularly called the Nearly Insane quilt. Author MadsPosted on June 28, 2014 November 7, 2014 Categories Patchwork of my life1 Comment on Windmills – No longer a UFO! 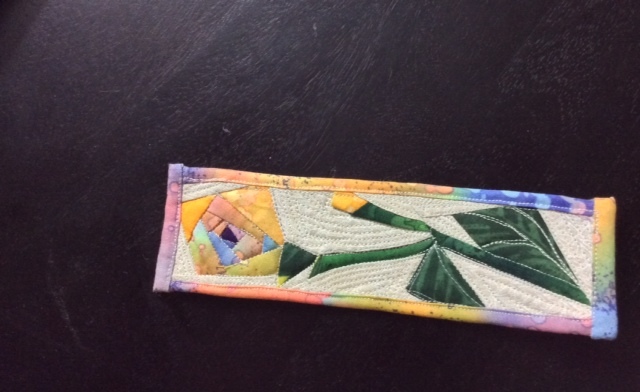 I quilted this bookmark as a gift for an unknown recipient in Japan! I used scraps (some as small as ¾” square!) of my precious Fossil Fern Fabric (by Bernatex) to piece the rose stem. It was totally improvised on a piece of fusible fabric stabilizer 2.5″ X 9″. When I discovered it could not be done in a single piece, I made a diagonal cut below the upper leaf, and pieced the lower leaf separately. The bud was an afterthought! I have made a paper piecing template for the bookmark which can be downloaded here Bookmark -Rose Stem Paper piecing Templates. Remember to print the templates in the landscape mode of your printer! The instructions can also be downloaded separately as a .pdf file, as I have not been able to work out how to put the instructions and templates in a single file Bookmark -Rose Stem -Instructions L It is presumed that you know how to do foundation paper piecing! There are several great tutorials available online too! Scraps in any colour of your choice for the flower and bud – I used 5 shades (Coded 9,2,7,8,5 – dark to light). 3″ X 9″ piece of heavy batting. You could use a double layer instead, if you do not have heavy batting. 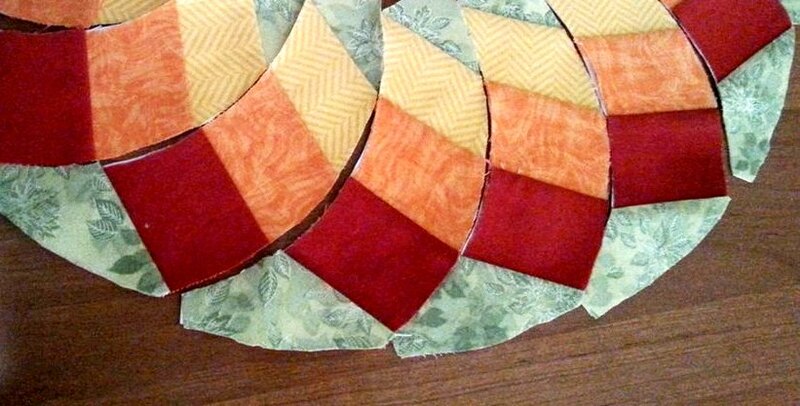 Print Paper piecing templates file. Remember to print this in landscape mode! There are 4 templates, A,B, C and D.
Reduce machine stitch length to 1 or 1.5 before you start piecing. You can trim the seam to about 1/6″, as the pieces are so small. Finger press to flatten after joining each piece. Do not trim the fabric that extend beyond the edges at this stage. Using master template given below as guide, join the pieced templates. Layer with batting and backing and quilt closely on background to highlight the flower and leaves. It would look even nicer hand quilted, I think! Double the binding strip length wise. Attach first to the longer sides and hem/ sew to the back. Trim binding at the ends. Fold shorter edge of binding inside before you attach it to the width of the bookmark for a neat finish. So go ahead, make your own bookmark! …and do link back to share your bookmarks if you decide to make them! 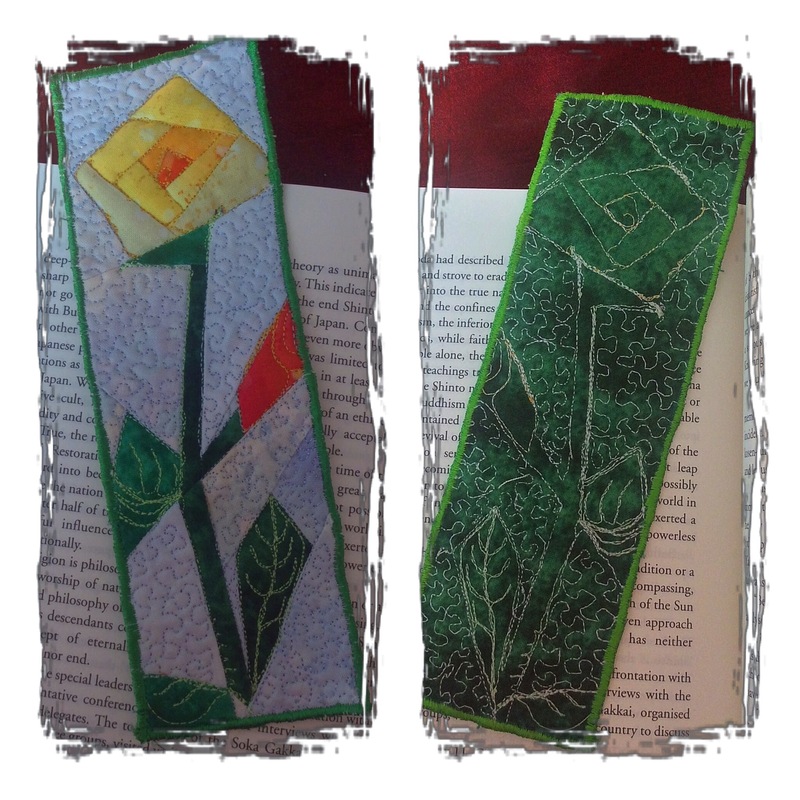 I recently had the ocassion to make this bookmark and have revised the master template and added some details to the instructions. I used the freezer paper method to piece the templates and could avoid having to take off tiny bits of paper after piecing! As you can see, I also did a button hole stitch on the edges instead of binding them. Author MadsPosted on June 7, 2014 November 23, 2016 Categories Free Stuff - Tutorials and Patterns, My Quilts, Patchwork of my lifeTags Free pattern, freebie, Paper foundation piecing pattern free, Quilt, quilted bookmark, Rose Stem quilted5 Comments on BOOKMARKED! Free Pattern!